Welcome to our BiCE Naples VIP Card!!! Discounts are for food only and not valid for happy hour or prefix menu. Cannot be combined with any other promotions. 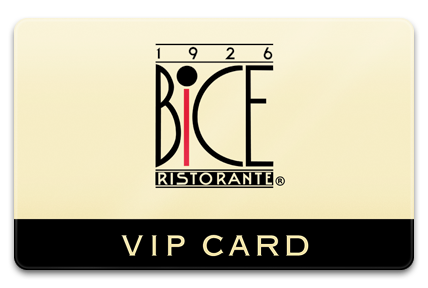 Just pay the one-time VIP enrollment fee of $25 and you will receive a $25 e-gift card along with your physical VIP Card to use at your next visit at BiCE Restaurant in Naples. The $25 e-gift card will be sent immediately to your email address and the physical VIP card will be mailed in a couple of days.